Gorgeous from the get-go, with toasted sesame, green tea, walnut husk, pistachio cream and peanut toffee notes seamlessly layered atop one another, framed by a subtle singed alder hint. Everything glides with grace through the finish like a gently wafting plume of smoke off burning incense. Drink now. 750 cases made. One of a series of releases by this Port producer, this Colheita, or Port from a single harvest, is beautifully poised between red fruits and mature almond and an old gold character. It has intensity, a product of the aging in wood that has just concentrated the wine. Like all Ports of this type, it is ready to drink. 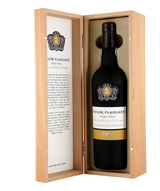 The 1968 Very Old Single Harvest Tawny Port comes in with 173 grams per liter of residual sugar. Taylor's started its ongoing 50-year Colheita program with the 1964 (or, as they prefer to say, "single harvest tawny port"). This is the newest release, scheduled to be in the marketplace by the Fall of this year. It was bottled in 2017 with a bar-top cork. It is hard to go wrong with any of the wines Taylor's has been releasing in this series-they all have something special to offer. We can debate endlessly which is better-often, the style difference is more important than a minor qualitative difference. This year's style shows finesse and more finesse. It is relatively elegant for an old tawny, with a controlled, sweet edge. Hints of brandy do periodically pop up, but they are not hard or harsh. It lingers beautifully on the finish as fine, old Tawnies do. The finish is often the best part of these oldies. This will last indefinitely, but it is meant to drink on release and needs no aging. Most do not hold Tawnies with bar-top corks. Drink it around 60 degrees Fahrenheit-and definitely not too warm. Most producers recommend 58 to 62 degrees Fahrenheit, depending on your preferences and the wine.